The end of this month marks the end of the first quarter of 2014. How has it ben going for you? Some challenges, and I am not referring to the great A to Z Challenge, have already presented themselves to the soft and fluffy author of Tronster.net. Did you make a New Year's resolution? Did it survive the first quarter of the year? I once watched a football movie, Any Given Sunday, where the coach was talking to the team. He explained the game is full of inches. The game also has quarters. For us in the United States, we get a Half Time for July 4th. Kids get Summer Break. (Hopefully teachers do too). 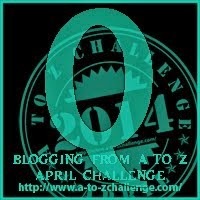 As the first quarter of 2014 comes to a close, and the last week of the challenge is approaching, I hope to carry on with the Blog and read more of the blogs that have been a part of the A to Z Challenge. Wach year I find new ones to follow and follow them until they seem to give up. Let us not give up. The game of football has four quarters, and the teams that plays all four, seem to be more successful.